Flying Lessons: Freedom to be gluttonous? I love the fourth of July as a summer ritual, as an opportunity to be with family and friends and most of all as an excuse to be unabashedly enthusiastic about being an American. But if there's one thing I'd like to change about this land that I love, it is the Fourth of July hot dog eating contest in Coney Island, New York. The annual event is a 10 minute spectacle of gluttony, and its a metaphor for what is wrong with America. For 92 years, Nathan's, the makers of very delicious hot dogs, sponsors a contest to see how many hot dogs participants can eat in 10 minutes. 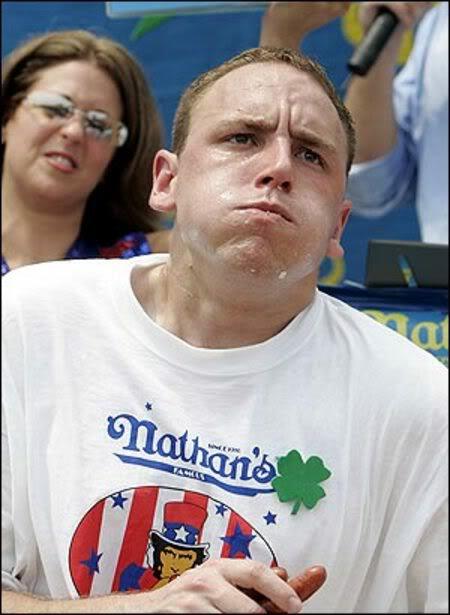 This year, Joey "Jaws" Chestnut won the prize after consuming 68 dogs in buns according to Nathans. b) inexcusable in a world where more than one billion people go hungry. Does eliminating an annual tradition do anything to address the problem of world hunger? Well indirectly, yes. Our nation has been so richly blessed we have an obligation to be responsible with resources and share our wealth. But when we consume a disproportionate amount of the world's food supply and glorify our excesses, our perspective becomes distorted. Gluttony is transformed to virtue. As long ago as 1630, John Winthrop preached to the settlers of New England that America would be as a "city on a hill" with the "eyes of all people upon us." Much has changed since then but the world is still watching America. What does it see? America is sometimes accused of being a degenerate country. Events like Nathan's hot dog eating contest do little to disprove the charge. I believe that we Americans are better than this. If I didn't, I wouldn't love the Fourth of July as much as I do.